The Mississippi River has had a profound effect on the landforms of coastal Louisiana. The entire area is the product of sediment deposition following the latest rise in sea level about 5,000 years ago. Each Mississippi River deltaic cycle was initiated by a gradual capture of the Mississippi River by a distributary which offered a shorter route to the Gulf of Mexico. After abandonment of an older delta lobe, which would cut off the primary supply of fresh water and sediment, an area would undergo compaction, subsidence, and erosion. The old delta lobe would begin to retreat as the gulf advanced, forming lakes, bays, and sounds. Concurrently, a new delta lobe would begin its advance gulfward. This deltaic process has, over the past 5,000 years, caused the coastline of south Louisiana to advance gulfward from 15 to 50 miles, forming the present-day coastal plain. For the last 1,200 years, sediment deposition has occurred primarily at the mouth of the Mississippi River's Plaquemines-Balize delta, in the area defined as the Mississippi River Delta Basin. This delta is located on the edge of the continental shelf of the Gulf of Mexico. Its bird's foot configuration is characteristic of alluvial deposition in deep water. In this configuration large volumes of sediment are required to create land area; consequently, land is being lost in this delta more rapidly than it is being created. The Mississippi River Delta Basin comprises approximately 521,000 acres of land and shallow estuarine water area in the active Mississippi River delta. Approximately 83 percent of this area, or 420,000 acres, is open water. The 101,100 acres of land in the basin are characterized by low relief, with the most prominent features being natural channel banks and dredged material disposal areas along the Mississippi River, its passes, and man-made channels. Coastal marshes make up approximately 61,650 acres or about 61 percent of the total land area in the Mississippi River Delta Basin. Eighty-one percent of this marsh is fresh, 17 percent is intermediate, and 2 percent is brackish-saline. The Mississippi River discharges the headwater flows from about 41 percent of the contiguous 48 states. On a long-term daily basis, discharges in the Mississippi River average 470,000 cubic feet per second (cfs). A peak discharge of approximately 1,250,000 cfs occurs on the average of once every 16 years downstream of New Orleans. Suspended sediment concentrations in the river decreased markedly between 1950 and 1966. Since that time the observed decrease in the suspended sediment load has been minimal. Long-term suspended sediment loads in the river average 436,000 tons per day; they have ranged from an average of 1,576,000 tons per day in 1951 to a still considerable average of 219,000 tons per day in 1988. Between 1974 and 1990 the land loss rate in the Mississippi River Delta Basin averaged 1,072 acres per year, or 1.69 percent of existing land area (Dunbar, Britsch, and Kemp 1992). Between the mid-1950's and 1974, the estimated land loss rate for the basin was 2,890 acres per year. This loss is the result of compaction, subsidence, hurricanes, tidal erosion, sea level rise, and human activities. The loss has been aggravated by maintenance of navigation channels and construction of canals for mineral exploration. The total land area lost in this basin over the last 60 years has been approximately 113,300 acres. The primary wetlands loss problem facing the Mississippi River Delta Basin is that of subsidence and compaction. Unlike other areas of coastal Louisiana, the Mississippi River delta is blessed with a relative abundance of inflowing fresh water and sediments. Despite the availability of these resources, the overall growth of emergent delta has been truncated in recent history. In its present position the Mississippi River deposits sediments into much deeper water than has been the case historically. This is evidenced by the thick stratum of Holocene deltaic sediments found in the active river delta. These unconsolidated sediments are highly susceptible to compaction, reducing the life span of emergent wetlands. While the rapid emergence of wetlands can occur over large areas in the delta, these areas deteriorate in an equally rapid manner. Human activities have aggravated land loss rates in the Plaquemines-Balize delta. The stabilization of the Mississippi River's channel has cut off seasonal sediment-laden overbank flow that once nourished adjacent wetland areas. The Mississippi River levees to the north, and associated erosion control and channel stabilization measures extending to its mouth, also preclude the possibility of a naturally occurring crevasse or change in the river's course. Many areas of the Louisiana coast suffer from a lack of the abundant fresh water and sediment found in the Mississippi River. Since the river is no longer free to alter its course and leave its banks to inundate vast coastal areas, the effects of human and natural forces which promote wetland deterioration are compounded. In this respect the relationship between the Mississippi River and the problems facing coastal wetlands is not limited to the river's delta, but extends across the entire Louisiana coast. The lack of growth in the Mississippi River delta, on a large scale, is as much a coast-wide problem as a basin problem. This source of ample fresh water and sediment, which shaped the Louisiana coast as we know it, is no longer producing a net gain in coastal wetlands, placing the entire Louisiana coast at risk. The Mississippi River Delta Basin is defined as all of the land and shallow estuarine area between the two northernmost passes of the Mississippi River and the Gulf of Mexico. The basin is located in Plaquemines Parish, Louisiana, south of the city of Venice. Baptiste Collette Bayou, on the east side of the river, and Red Pass, on the west side, form the basin's northern boundary. This area is also referred to as the Plaquemines-Balize or "bird's foot" delta. The basin encompasses approximately 521,000 acres and is shown in Figure MR-1. Approximately 129,000 acres of land and water in this basin are in public ownership. This includes approximately 14,000 acres of the river's channel and passes which are navigable waterways of the United States. Since 1932, the Mississippi River Delta Basin has lost approximately 70 percent of its total land area. The composite of recent loss rates presented above was used to predict future wetlands losses. The total projected wetland losses over 20- and 50year time spans represent, respectively, 35 and 87 percent of the existing wetlands in the basin and are shown in Table MR-1. Based on this loss of wetlands, only 5 percent of the original 1932 land area in this basin would remain intact in 50 years. The unique opportunity present in this basin is the tremendous volume of sediment transported by the Mississippi River. The need which must be addressed with this resource is not limited to only this basin. The needs of the entire coast of Louisiana are linked, inseparably, to the unique opportunity that the Mississippi River presents. Two alternative strategies were developed for this basin. Strategy One involves the study and development of a major uncontrolled diversion of the Mississippi River for the creation of a new delta, while maintaining the navigation route in its present location and managing the retreat of the existing delta. Strategy Two would maintain the course of the river in its present location and optimize the growth of the existing delta through redistribution of the available flows and sediments throughout this location. the river's main flow translates into large gains in newly emergent wetlands over potentially hundreds of years. It should also be recognized that the existing delta, if left to natural processes, would ultimately be abandoned and its wetlands lost. It is also important to note that the same short-term strategy can be implemented under either major strategy. Many of the measures which can be taken to enhance the current delta configuration under Strategy Two will, in some scaled form, be used in preparing the existing delta for a diversion of the river and in managing its retreat under Strategy One. This allows the execution of the plan to proceed in the short term regardless of which major diversions may ultimately prove feasible. Under the selected course of action, Strategy One, the proposed study would look into all viable options for undertaking the relocation of the river's primary delta. The restoration plans in both Breton Sound and Barataria basins are compatible with some form of large scale diversion as outlined in this basin. At this time the principal site for consideration is Breton Sound, although others will be evaluated. In managing the retreat of the existing delta a number of small to moderate wetland creation projects will be undertaken in the short term. These projects will utilize available flow and sediment resources to expand and stabilize the existing wetlands in the delta prior to the onset of its retreat. In addition, a coordinated program of dredged material disposal, both from maintenance and dedicated dredging projects, will help to establish a line of barrier development throughout the existing delta. The major strategic points of the selected strategy are presented in Figure MR-2. 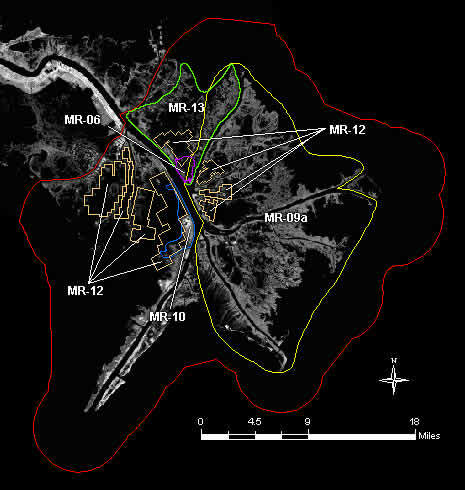 The concept of a major sediment diversion has been previously investigated at a reconnaissance level in the Louisiana Coastal Area, Mississippi River Delta Study completed by the U. S. Army Corps of Engineers, New Orleans District, in February 1990. This information should provide the basis for the next study level, a detailed feasibility study. The significance of the available resources and the present lack of net delta growth is magnified in view of the extent of the larger wetlands loss problem in coastal Louisiana. This is apparent in a present day context and historically as well. In consideration of this fact, the selected strategy adopts an aggressive approach that would initiate the growth of a new delta. The basis for this selection is that the resource available in the Mississippi River cannot be under-utilized in the rebuilding and maintaining of the Louisiana coast. To achieve the goal of maintaining the current level of wetland functions and offset the high rates of wetland loss, measures which net large gains in coastal wetlands must be pursued. With this alternative, the transition from a posture of status quo to one of aggressive rebuilding is achievable. The benefits for the major project in this plan, the Uncontrolled Mississippi River Diversion, will be accrued in some other coastal basin. For the purpose of comparison with short-term projects (20 years), the cost and benefits of this project are estimated to be $428,720,000 and 61,290 acres. The project costs $910,000,000 and creates 89,300 acres over 50 years. Once constructed this project will continue to function well beyond 50 years, resulting in additional benefits and requiring continued maintenance. These benefits represent a significant reduction of wetlands loss from a coastal standpoint; however, they cannot be applied directly to the prevention of wetlands loss in this basin. The direct costs and benefits of the selected plan in this basin are $23,910,000 and 24,600 acres, respectively. Based on these benefits, implementation of the selected plan will eliminate all projected loss and produce a net gain of 3,160 acres of wetlands over 20 years. The specific costs and benefits for known projects can be found in Table MR-2, which includes all projects in the selected plan. The costs and benefits for the selected plan include only those projects with established designs. These include the long and short-term critical projects and all short-term supporting projects with the exception of any vegetative planting projects. Costs and benefits are shown for the long-term Bohemia Sediment Diversion project; however, this project would serve as a precursor or alternative to the critical Uncontrolled Mississippi River Diversion project. Because of this overlap, the costs and benefits of the larger, more crucial project have been included in the totals. Additional costs and benefits may be forthcoming as the details of additional supporting projects become known. In the development of major strategies for this basin, measures to accommodate deep-draft navigation access between the Mississippi River and the Gulf of Mexico were of major concern. With a significant portion of national commerce dependent upon this deep-draft navigation route, it is essential that access between the river and the gulf be maintained without significant disruption. Any major reduction in the flow of the Mississippi River will result in a reduction of the naturally maintained channel. This would in turn result in increased dredging requirements. Other important areas of impact exist under Strategy One. One would be the deterioration and retreat of the existing delta. The presence of the Delta National Wildlife Refuge and the Pass a Loutre Wildlife Management Area in the existing delta makes this an area of major concern for both State and Federal wildlife and fisheries authorities. Achieving a smooth transition, and a long-term net gain in acreage, from one delta area to the other is a specific concern and requires verification. The effects of the diversion in the receiving area also require study and verification. In Breton Sound, for example, a large number of oyster grounds and the Breton National Wildlife Refuge at its gulfward extent would be affected by the influx of fresh water. Beyond these concerns a key issue to be addressed in this basin has ramifications for all of coastal Louisiana; a change in the basic philosophy for the selection and execution of environmental projects is needed. The Mississippi River, as the fifth largest drainage on earth, provides a resource of a global proportion. With a sediment output of millions of tons annually, the Mississippi River is responsible for the geology of the Louisiana coastal zone from Vermilion Bay to the Mississippi Sound. The present day utilization of this resource exhibits the manner in which the management of a significant resource to support one set of goals may lead to critical deficiencies and needs in meeting alternative goals. Significant impacts to wetlands can be traced to existing projects intended for the protection or enhancement of long-term economic investment, both private and public. The decision to invest public funds in these projects has historically been based on the ability of the project to provide a positive level of benefit, measured in economic terms, within a relatively short project life span, traditionally 50 years. The cycles associated with natural processes and the life spans of the geologic and environmental features they produce are quite often much larger. An adjustment must be made in this basic analytic philosophy in order to select and execute environmental projects and to undertake the large measures necessary to overcome present wetland trends. The perceived disparity between the initially analyzed, and the actual long-term, effects of existing water resources projects emphasizes the need to re-establish the essence of historically occurring natural processes. To accomplish this, a more foresighted philosophy for the recommendation, development, and execution of environmentally oriented projects is needed. Simply stated, the philosophy for successfully undertaking environmental restoration is to look beyond traditional short-term analyses of costs and benefits. The true benefits of these restoration efforts lie well beyond their immediate effects, in the long-term gains which ultimately provide the equilibrium necessary for the long-term conservation of coastal Louisiana. The Mississippi River Delta Basin is defined as the land and estuarine area between the two northernmost passes of the Mississippi River and the Gulf of Mexico (figure 14). The Mississippi River alluvial valley drains over two-thirds of the continental United States, and, as a result, carries an enormous amount of water and sediment captured by the river during storm events and high water periods. The average water discharge for the river is 470,000 cfs, and the average suspended sediment load transported by the river is 436,000 tons/day. For the last 1,200 years, this sediment has been deposited primarily at the mouth of the Mississippi River's current Plaquemines-Balize Delta. In recent decades, the delta front has been building laterally into the Gulf of Mexico at a rate of 300 to 400 feet/year. Currently, the delta front is located at the edge of the Gulf of Mexico's continental shelf. As a result, large volumes of sediment are now being lost to the continental slope or ocean floor, where water depths are up to 1,000 feet and, therefore, not conducive for land-building. Much of the Mississippi River Delta Basin has experienced rapid coastal land loss (figure 14). Recent land loss estimates for the basin average between 819 (Barras et al. 1994) and 1,337 acres/year (Dunbar et al. 1992). Since 1932, the basin has lost approximately 70% of its total land area (LCWCRTF 1993). At current loss rates, up to 26,740 acres will be lost during the next 20 years (53,600 acres over 50 years) if no wetland restoration efforts are implemented. This land is being lost due to many factors, including compaction causing a subsidence rate of 5 feet per century, loss of sediment, possible fault zones, tidal and boat wake erosion, sea level rise, hurricanes, and human activities such as maintenance of navigation channels and construction of canals for mineral exploration. The basin comprises approximately 521,000 acres, of which 83% is open water. The remaining 101,000 acres consists of freshwater to brackish marshes that are highly valuable as fish and wildlife habitat. All the CWPPRA projects selected in the Mississippi River Delta contribute to the basin's objective of stabilizing the existing delta and its marshes. Given the extensive wetland deterioration that has occurred in the delta, numerous potential locations for future restoration projects exist. Locations for all projects selected thus far have been appropriate and have received full support from the two largest land owners in the delta, the Louisiana Department of Wildlife and Fisheries (LDWF) and the U.S. Fish and Wildlife Service (USFWS). These agencies play a large role in site selection of both state and CWPPRA projects to ensure maximum benefit to the surrounding wetland area. All future projects will follow the same procedure of site selection and approval by the land owner and lead agency. Further studies should demonstrate which variables are most important to consider in selecting a location for a crevasse and dictate some standards for their design.